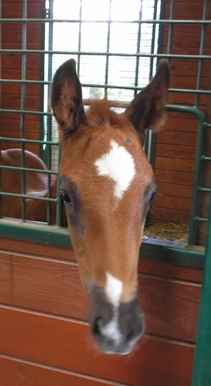 The photo to the left is from Fran Jurga's blog article and video on hoof keratoma surgery. It's the kind of surgical procedure Riley is having. I made the image MUCH smaller to reduce the gross-out response -- but I figured if you are interested in horse medicine you're tough enough to take it. Apologies to the squeamish. The COTH posting Ever had coffin bone debridement? has a good deal of information about the type of surgery Riley is having. The poster's horse was diagnosed with a keratoma (kind of a tumor?) near the coffin bone, and on performing surgery they decided it was an abscess. For better or for worse, one poster provides links to her horse's hoof in various stages of ghoulish recovery. I'm can handle horse-related medical shots, but the thought of Riley's foot looking like that had me breathing into a paper bag. If you choose to click on her link, note her "graphic photo" warning! My gelding had a keratoma removed in 2004. On the x-rays is showed up as a black area. His was on the tip of the coffin bone, so part of it was removed as well as the Keratoma. This owner's horse had a different sort of problem -- or so they thought -- and I'm hoping Riley's surgery is less invasive. Trim the hoof since farrier care may not be possible for a time after surgery (hey, no one told me this -- will they do it???). Taping radiopaque markers (BBs) to the hoof wall and take a sequence of radiographs to find the lesion location. Administer systemic antibiotics and NSAIDS. Perform antibiotic perfusion with tourniquet. Anesthetize the horse, either with local or general anesthetic. 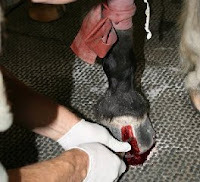 Go in through the hoof wall (preferred for comfort of the animal) or sole, depending on the the extent of the bone lesion and soft tissue infection. Sometimes both the sole and wall will need to be invaded. For entry via the hoof wall, use a drum sander or motorized burr. Use n. 3 or 4 bone curettes to expose the bone. Diseased bone will be soft and discolored, and it ca be curetted out. Pack the area with iodine and gauze pads. Apply sheet cotton bandages, one front to back (folded long ways) and one side to side. Wrap with elasticon bandage. Pressure should be applied to control bleeding. Change bandage daily until the site is dry. Why did I think your horse had been diagnosed with pedal osteitis? Either way, not to worry. Remember tht Da Hoss won the Breeders Cup Mile twice...and he only had half a coffin bone. I'm sure your horse is in very good hands! Hi Fran, you're right, it was pedal osteitis. I'm figuring the surgery is the same or similar though. Am I wrong? Wow, that was really fascinating. I can't wait to get on to vet school. I would think that if you find a good farrier (we use a British-certified farrier, so he had to go through several years of "farrier college" before he could earn his license, so I guess that's good haha! And he has done some amazing work with my rescue mare that had an abscess as well as another rescue mare of mine that had a fused knee, he trimmed the hoof so it would work with her gait. My rideable mare just needs trimming from him so far) they should be able to trim the hoof correctly before and after surgery, in a way that aids the healing process and makes sure the hoof ends up looking and functioning back to normal in the end. Ask your vet for any therapeutic farriers in your area, that's how we found ours. If that's what your question was asking? ?